The spring editions of the many angling magazines are full of tips on what you should be doing to tempt the wary trout. Trouble is if you read two or three articles, then information overload sets in and you find yourself taking the advice of these ‘experts’ and trying out unfamiliar techniques which you don’t really believe and with disappointing results to follow. Best to stick to the methods you know will work and cast with confidence. Mike Frost did just that, using his Hot Head Damsels and fifteen nice fish fell for the Damsel’s blandishments. Neil Summers also had a great day using Small Bugs and Hare’s Ears he brought thirteen to the net. Ernie MacKay used the ever reliable Cats Whisker to tempt seven and Ewen Reid that other favourite the Yellow Dancer to entice eight fish all between two and a half and four pounds. Other established favourites -Nomads, WSW’s and P.T.N’s– continued to be successful. 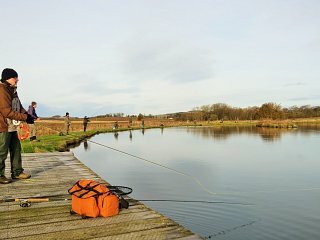 Finally a reminder to anglers that The Spring Singles event is scheduled for Sunday 2nd of April. Please contact that fishery on 01651 872787 or 872000 to enter. The spring editions of the many angling magazines are full of tips on what you should be doing to tempt the wary trout.